It’s no secret that we slow down as we get older. We lose a bit of flexibility and strength, it takes longer to recover from an injury, and staying in shape takes more effort. It’s especially challenging, because some of the higher-impact workouts that we can do when we’re younger are out of the question when we’re older. Fortunately, research shows that Pilates is a perfect way to stay fit, safely. 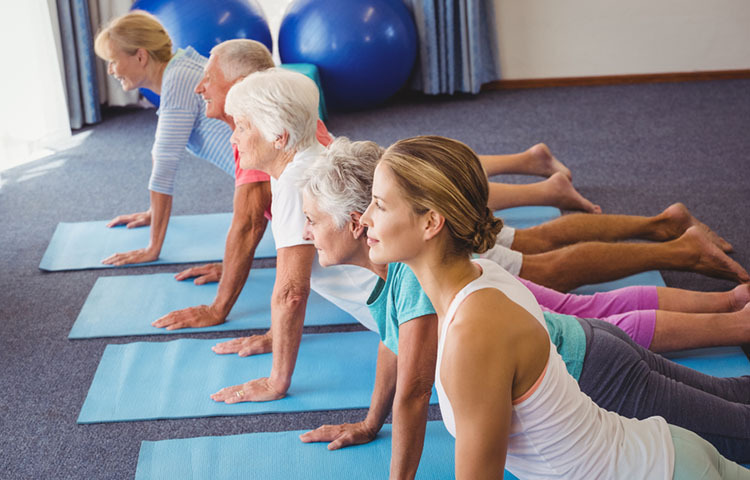 In this study, sports medicine researchers from Brazil looked at eighteen women over the age of 60 who had not done any Pilates or strength training in the previous six months. As part of the study, the women took part in mat Pilates class three times a week for six weeks. The women were given six different functional capacity tests at four weeks before the study began, at the beginning of the study, and after six weeks of Pilates. Improvements in stamina in the “Chair Stand test,” indicating increased strength in hip and knee extensor muscles. Improved flexibility in the lumbar and hip joints. These improvements are especially important for older adults, as maintaining balance, strength, and flexibility helps keep people active and less prone to falls or injury. Bertoli J, Biduski GM, de la Rocha Freitas C. Six weeks of Mat Pilates training are enough to improve functional capacity in elderly women. Journal of Bodywork & Movement Therapies 2017 Oct;21(4):1003-1008. doi: 10.1016/j.jbmt.2016.12.001.